Este é outro dos poemas mais conhecidos de Mensagem e tal como os seus pares (Infante, Mar Português, e Mostrengo) a linguagem é clara e quase não requer explicações. "o mar com fim..."- o Mediterrâneo; "o mar sem fim..."- o Oceano. "o que me há na alma (...) só encontrará, de Deus na eterna calma, o porto sempre por achar"- irei sempre mais longe porque, por mais longe que vá, haverá sempre um porto por descobrir; só descansarei (só encontrarei esse porto) depois de morrer. palavras mantidas em ortografia antiga: deante= diante; signala= sinala (assinala); immenso= imenso; portuguez= português. 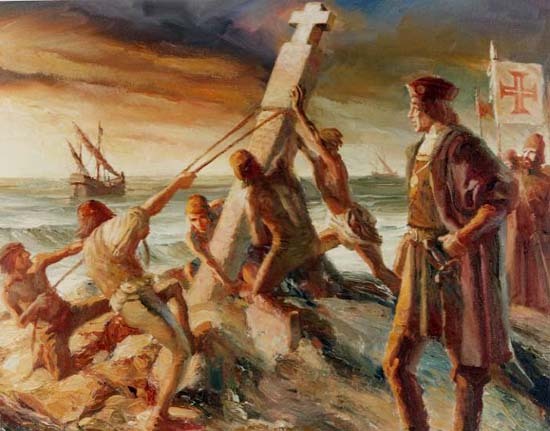 An introduction to the poem: The early discoverers used to mark newly found lands with a wooden cross. King John II ordered those markers to be made of stone, for greater durability. A typical "padrao" was a stone pillar topped by a cross beneath which was engraved the Portuguese coat-of-arms. Some of these stone markers lay unnoticed by all until rediscovered in the late XIX century, some 400 years after they were erected and are a moving memento to those who left them to signal "to the wind and the skies" that the caravels of King John II had reached those distant strands. The task is great and man is small. And onwards set my course. The soul is divine and the work is imperfect. What is left to do, is God's will. The sea without bounds is Portuguese.